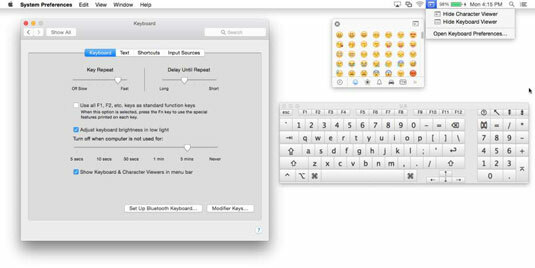 The Keyboard System Preference pane in OS X Yosemite enables you to modify the behavior of your keyboard in a myriad of ways. So the first thing to do is open the Keyboard Preference pane by choosing Apple→System Preferences and clicking the Keyboard icon. The Keyboard System Preference pane has four tabs: Keyboard, Text, Shortcuts, and Input Sources. Drag the Key Repeat slider to set how fast a key repeats when you hold it down. This feature comes into play when (for example) you hold down the hyphen (-) key to make a line or the asterisk (*) key to make a divider. Drag the Delay Until Repeat slider to set how long you have to hold down a key before it starts repeating. Use All F1, F2 Keys as Standard Function Keys: If this check box is selected, the F keys at the top of your keyboard control the active software application. To use the special hardware features printed on each F key (display brightness, screen mirroring, sound volume, mute, and so on), you have to press the Fn (Function) key before pressing the F key. If the check box is left deselected, you have to press the Fn key if you want to use the F keys with a software application. Finally, these keys may not work if you use a third-party keyboard (one not manufactured by Apple). Adjust Keyboard Brightness in Low Light: This check box turns your laptop’s ambient keyboard lighting on and off. Turn Off When Computer Is Not Used For: This slide control lets you determine how long the ambient keyboard lighting remains on when your computer isn’t in use. Of course, if your MacBook doesn’t have ambient keyboard lighting, as many don’t, you don’t see the last two items. Ambient keyboard lighting is a cool feature, but it reduces battery life. Show Keyboard & Character Viewers in the Menu Bar: This check box adds a new menu for opening either of these useful windows. Click any character to insert it in your document; click the little icons at the bottom of the window to view additional screens full of characters. 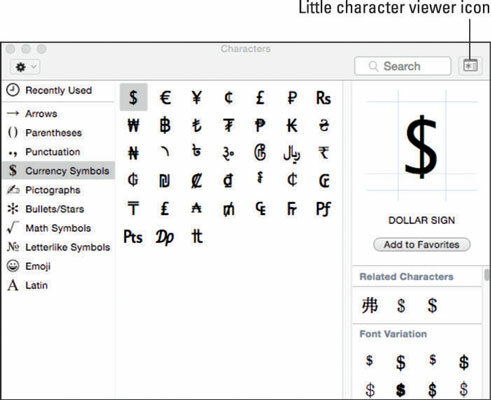 Some people prefer the look the Character Viewer had prior to Mavericks and Yosemite. While both looks offer the same old characters you know and love, the presentation has changed. Never fear. If you prefer the old look and feel, scroll to the top of the window and click the little Character Viewer icon to the right of the search field. This transforms the Character Viewer back to its pre-Mavericks look. Click the Action menu (the little gear near the upper-left corner) and choose Customize List to enable additional character categories, including Braille Patterns, Dingbats, Geometrical Shapes, Musical Symbols, and many more. Set Up Bluetooth Keyboard button: Launches the Bluetooth assistant and walks you through pairing and setup as described in Chapter 13. Modifier Keys button: Lets you change the action performed by the Caps Lock, Control, Option, and Command keys. It’s particularly useful if you use a non-Apple keyboard, although it works just fine on Apple keyboards, too. The Text tab has the Correct Spelling Automatically check box. Enable it (if it’s not already enabled) and be done. Spelling correction is good, but the Text tab also lets you create shortcuts to replace short phrases with longer ones. It’s a very handy trick, indeed. Plus, a preview pops up just below your typing so you can accept the replacement by pressing the spacebar or reject it by clicking the little X or pressing Esc. To create your own shortcuts, click the little plus sign near the bottom-left corner of the window. Type the short phrase in the Replace field, click in the With field or press Tab, and then type the replacement phrase. Although it’s not obvious, you can create multiline substitutions. Just hold down Option and press Return to start a new line of text. If you really hate to use your mouse or if your mouse is broken, keyboard shortcuts can be really handy. You probably don’t want to mess with the default shortucts, but you can assign other commands you use often to just about any key combination you like. By creating your own keyboard shortcuts, you can have whatever commands you need literally at your fingertips. Not only can you add, delete, or change keyboard shortcuts for many operating system functions (such as taking a picture of the screen or using the keyboard to choose menu and Dock items), but you can also add, delete, or change keyboard shortcuts for your applications. To change a shortcut, first click the appropriate application, preference, or feature in the left column. Next, double-click the shortcut you want to change on the right side of the right column (for example, F3 or Command+G). The old shortcut becomes highlighted; when it does, press the new shortcut keys you want to use. To add a new shortcut, click the + button. Choose the appropriate application from the Application pop-up menu, type the exact name of the menu command you want to add in the Menu Title field, and then type the shortcut you want to assign to that command in the Keyboard Shortcut field. If the shortcut you press is in use by another application or preference, a yellow triangular caution symbol appears next to it. It really is that simple. To delete a shortcut, choose it and then click the – button. If you choose the Text Boxes and Lists Only radio button, the Tab key moves the cursor from one text box to the next or from one list item to the next item (usually alphabetically). If you choose the All Controls radio button, you can avoid using the mouse for the most part, if that’s your preference. The Input Sources tab is where you can choose to display one or more foreign language keyboards in the Input menu. The Input menu and the Keyboard and Character Viewer menu are one and the same. If you select one or more foreign keyboards, the icon in your menu bar changes to the flag of the selected keyboard.